Optimum Security provides customized security solutions for individuals, homes, and businesses throughout Abbotsford. Whether you need a temporary security guard for a special event, asset protection in a retail environment, or a fully-integrated CCTV and monitored alarm system, we can help. We offer a complete range of professional security services in Abbotsford that are tailored to your unique needs and requirements. When you contact us, you can rest assured that we’ll work hard to take good care of you, your clients, and your valuable assets. 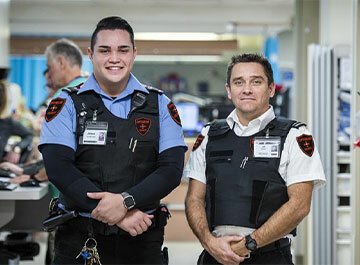 Our team of private, uniformed Abbotsford security guards have all been carefully screened and trained to the the highest standards to ensure your safety. Our officers are all highly skilled in loss prevention, personal protection, crowd management, and risk assessment. We can provide both onsite and mobile patrol officers for your construction site, retail outlet, private residence, or special event, and we can quickly adapt our service levels to respond to your immediate security needs. If you are concerned about combating theft, vandalism, and unwanted visitors at your Abbotsford home or business, we can help. We design, install, and monitor advanced alarm systems complete with CCRV cameras, heat and smoke detectors, flood and water detectors, and two-way voice communication that allows you to connect directly with our 24/7 monitoring team in the event of an emergency. For more information about how our team of security specialists can help protect your Abbotsford home, business, or organization, contact us at (604) 664-9229 for your free, confidential consultation.